Meghan Markle has been left distraught after her beloved rescue dog Guy broke two legs. 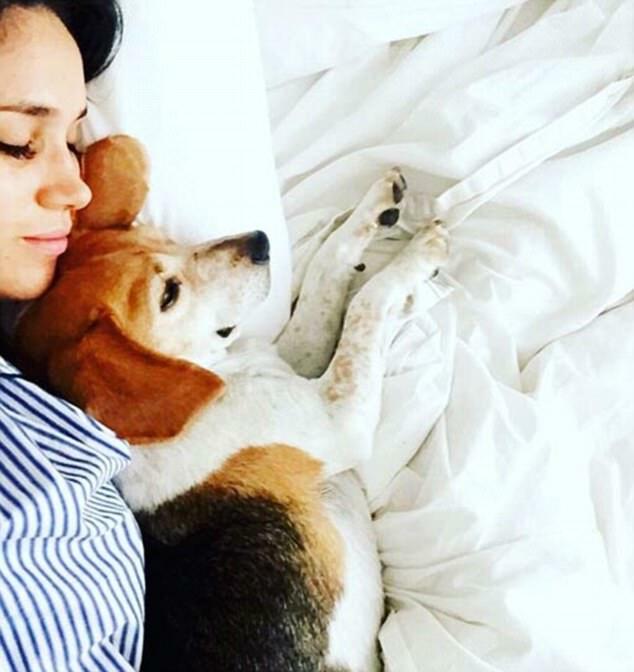 The beagle – described as Meghan’s ‘absolute world’ – was injured shortly after Clarence House announced the actress’s engagement to Prince Harry. Guy was flown to London earlier this year from Toronto where he lived with Meghan while she worked on television series Suits. While it is not clear how the injuries occurred, The Mail on Sunday understands that the dog is receiving treatment from television ‘super vet’, Professor Noel Fitzpatrick, who is renowned for his bionic surgery techniques. Prince Harry is said to have joined his anguished fiancee on visits to see Guy. The dog is believed to be receiving treatment at a facility in Surrey. Last night, sources close to the couple said Meghan was ‘distraught’ and ‘very upset’ about Guy’s condition. It is further turmoil for Meghan, who has already had to say goodbye to her labrador-shepherd cross called Bogart after he was deemed too old to fly to the UK. Guy arrived to join his owner having gone through a lengthy checking process. To secure permission to live in the UK, foreign pets must be microchipped, be given a rabies vaccination, and then have a blood test 30 days later. In an interview earlier this month, Meghan revealed: ‘One [dog] is now staying with very close friends and my other, little Guy, he’s in the UK, he’s been here for a while. Meghan has previously described her dogs as ‘my boys’, and gushed that they ‘mean the absolute world’ to her. During her time in Toronto, the animals repeatedly appeared on her Instagram page and were pictured snuggled up in bed with her. Last night a spokesman for Kensington Palace declined to comment.